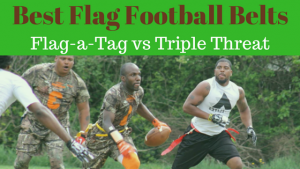 Find the best flag football adult leagues, pickup games and tournaments in the state of Texas. 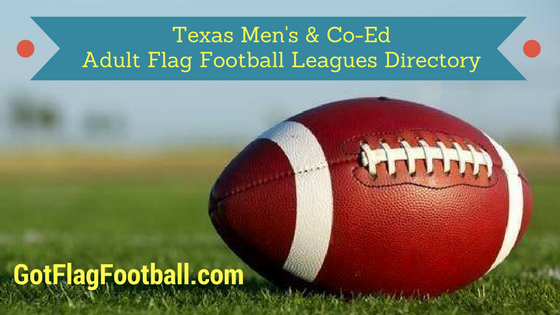 Below you’ll find the top up-to-date for 2019 list of fall, winter, spring and summer, indoor and outdoor local flag football leagues, pickup games and organizations that offer tournaments, organized from the highest to least populated cities and towns in TX. 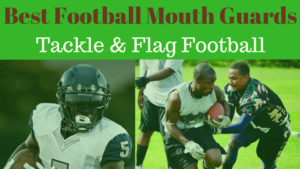 GotFlagFootball.com brings together the recreational and competitive local flag football Texas community of organized leagues, city recreational leagues and pickups in one list (in alphabetical order), so that it’s easy to find a game near you. 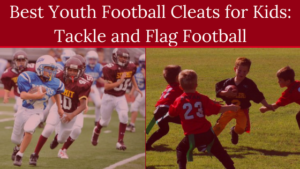 City of Houston offers flag football seasons in the Winter, Fall, and two in the Spring. All season’s have men’s only divisions and co-ed divisions. Games are played between 6:30pm and 10:30pm on various nights of the week. All seasons run for 5 weeks, and are played outside. Houston Flag Football runs various leagues throughout different seasons. Games are played outside, and seasons conclude with a playoff tournament. 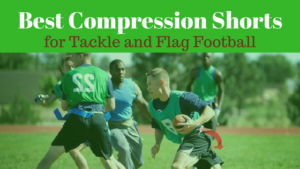 The group also runs single day flag football tournaments throughout the year. Houston Sportsplex offers men’s 8v8 and co-ed 8v8 flag football leagues. Each season runs for 6 weeks, which consists of 5 weeks of double-headers followed by a single elimination playoffs for all teams at the conclusion of the season. Houston Sports and Social Club offers a number of different games, played during Fall and Winter and on most nights of the week. Games are played outside. Typically, a season guarantees 7 games, with playoff formats differing depending on the exact league joined. This is a male only league, available for men of all skill levels. Games are 7v7, and seasons consist of a regular season plus playoffs. Games are played outdoors, and the season is during the Fall. 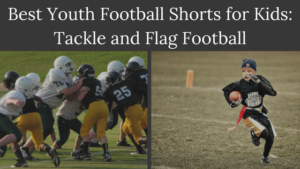 Sports Monkey offers flag football leagues in the Summer and the Fall, which are available for both men and women. Most leagues are co-ed, and games are played from Monday through to Thursday depending on the league. Games are 8v8, with co-ed leagues requiring 5 males and 3 females on the field at a time. The season consists of 10 games in 5 weeks, followed by 1 week of playoffs. 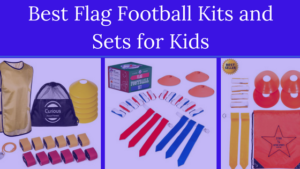 A number of flag football leagues are offered here. There are both co-ed leagues playing on Saturday’s, while male only flag football leagues run on Thursday’s and Saturday’s. All leagues seasons consist of 10 games plus playoffs, and various awards are given throughout the year to leaders of different statistical categories. This is an 8v8 league with two separate divisions – social, and super social. It is co-ed, and at least 3 of the 8 players on each team must be female. Games are played at night during the week, and the season runs for 7 games. Playoffs follow for the top teams. Big D Sports runs co-ed leagues on Wednesday nights and Saturday’s during the day. There are two divisions, with one being more social and the other more competitive. Seasons run for 8 games, plus playoffs for the top teams. Games are 8v8, and are played outside. Men’s and co-ed leagues run here on multiple nights of the week. There is a male only 8v8 league, a men’s 5v5 league, and a co-ed 8v8 league. Male leagues consist of 6 games per season, while co-ed leagues have 7 game seasons, and there are playoffs for all teams in both leagues. Games are played outside. Flag Tourney features 100 talented athletes across 10 teams in a tournament style of play. Competitors are mostly from DFW and will participate in the 2-day event to win team championship trophies and individual skills competition prizes. This tournament features a draft of all registered players after a display of skill at a scouting combine. Teams are created and may pit friends and former teammates against each other. The talent is spread across every team and all the teams are mostly even. New relationships and friendships are forged and everyone has a good time. Flag Tourney is a unique experience. Registration includes food, snacks and a team t-shirt. Co-ed leagues are offered here. An 8v8 league is split into two different divisions for players of different skill levels, and at least 3 players per team must be female. A 5v5 league is also offered, with 2 females required on the field at a time. Seasons consist of 6 games plus playoffs, and games are played outside. Men and co-ed flag football leagues are offered by ATX Sports and Adventures. Games are played on Sunday’s, between 11am and 10pm. The season consists of 6 regular season games plus playoffs for qualifying teams. The games are 8v8. This is an 8v8 co-educational league. Each team must have at least 3 females on the field at a time. There are at least 7 games per season for each team, with playoffs for the top teams. It runs in the Fall, and you can choose to play games on either Monday, Wednesday, Friday, or Sunday. Capital City Flag Football runs leagues in the Spring, Summer, and Fall. Games are played on Monday-Thursday evenings, and there men’s, women’s, and co-ed leagues available. Seasons run for 10 games in the Spring and Fall, and 6 games in the Summer. Games are played outdoors. 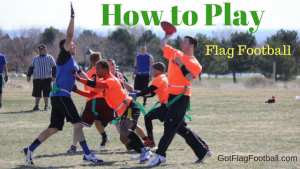 There are leagues run by Flag Football X throughout the year, as well as various tournaments. Leagues offered are 8v8, 9v9, 5v5 or 4v4. Most leagues run on Saturday or Sunday, however it varies depending on the specific league and division. A variety of different leagues are offered here, for both men and women. Leagues are separated into a number of different divisions to cater for players of differing ability. Seasons run for 10 to 11 games, with a playoff series held at the end. Games are played outside. 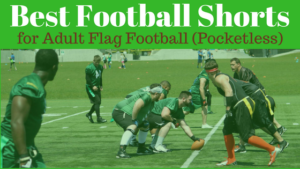 Sun City Flag Football League runs seasons in the Winter and the Summer. Different divisions are available to register in, and game time depends on your exact league. Games are played outside. Summer leagues are offered by Plano city council, which has both men’s flag football and co-ed flag football.